Do you have a signature scent for your home? Or a seasonal favorite home scent? Last week I made a ‘Lavender Vanilla + Lime’ spring blend to spray on our sheets and towels. Ah, it smells so refreshing! Like a late spring day! The simple recipe I used is below. Recently I mentioned that while I’m not very crafty, I can putter around the house like nobody’s business. A lot of you related to my secret talent, ha! You are my people. Well, I may not be very crafty, but I actually do have a few things I love making for my home. When I’m puttering around the house, I enjoy making things prettier. Often that means visually, but I like to make my house smell prettier, too. I shared my love of having signature scents for my home in the very beginning days of the blog (and in my first book Love the Home You Have. Side note: as of yesterday I noticed that book was just $1.99 for the kindle version!). 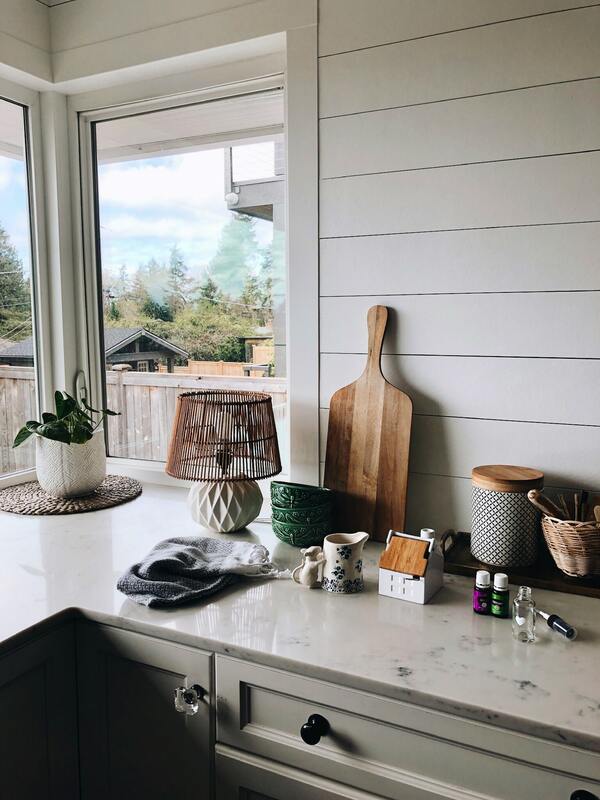 In my new book Dwelling I talked about how incorporating natural scents into our day-to-day experiences around the home can elevate our sense of well-being! Scents can be inspiring, like a little gift to yourself. Custom linen and room sprays are easy to put together and fun to make. Unlike more complicated crafts or DIY projects that might result in a frustrating experience (like the time ten or so years ago when I accidentally super-glued my fingers together, hahah, you can read that story here), making a custom linen spray is a simple, enjoyable and relatively hassle-free project. Creating a signature scent to spray on linens is a home improvement project that makes putterers like me very happy :). Simple joys. Shake it up and spray away! I mist this on our sheets (and towels!) before I make the bed and before I go to bed. It smells so dreamy, it really relaxes me and helps me to sleep better! You can watch me make this spray in my Instagram story highlights here! 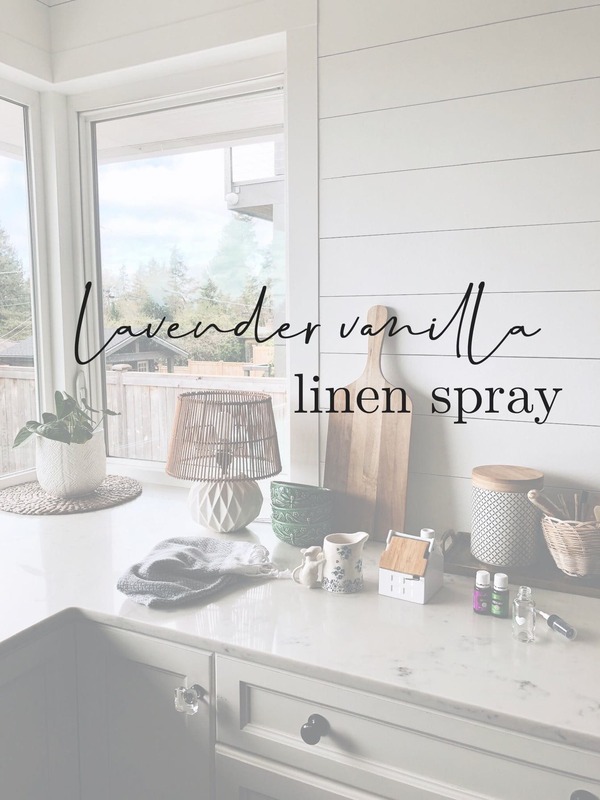 The essential oils found in this linen spray and the brand my family loves and recommends is found here (there is a special deal this month, too!). Your creamer is super cute, but it sure looks like a mouse, not a bunny? You definitely made me smile this morning. I’m a huge bunny lover, so I kept looking at the pic trying to find the bunny creamer, but I think the tail gives it away. love the linen spray idea! I was wondering about the addition of sea salt – is there a specific benefit to adding that to the mixture? This sounds perfect for this time of year, Melissa! I wear a lava bracelet with a few drops of Stress Away to work every day….I can’t tell you how often I find myself sniffing my wrist! Oh, I do the same!! I love it. People probably think I’m weird hah! But Stress Away is so good, isn’t it? Enjoy! Love this – I’ll have to give it a try. I have a somewhat unrelated question – the small lamp in your pictures is so cute, but where is the cord? Often when I buy small lamps like that, I can’t place it on places like the kitchen countertop because the stupid cord is too unsightly. Many catalogs show cute lamps but there’s no cords. What is your secret? I can imagine how lovely and refreshing that scent must be! I’ve been interested in essential oils for home, health and beauty for a long time. Our daughter (several hundred miles away) is a believer, over the course of 3-4 years, she has eliminated every chemical “thing” from her home. 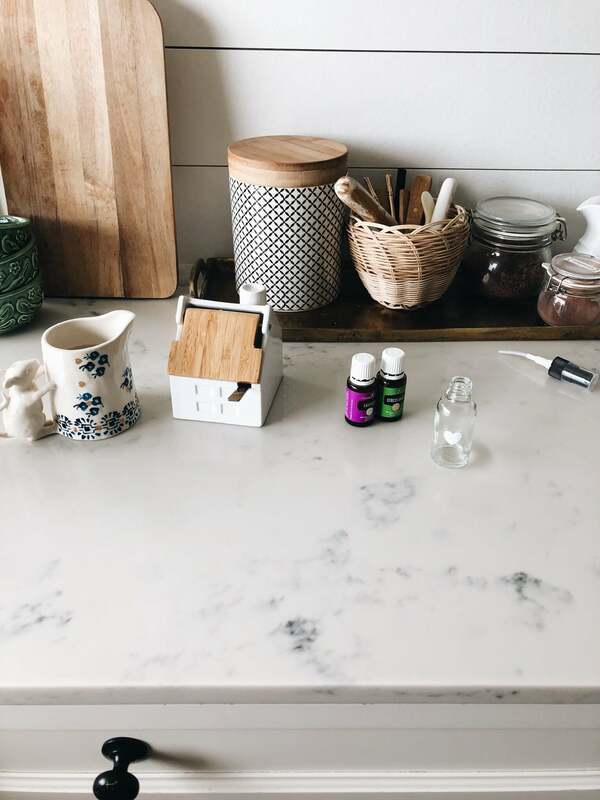 If I had not seen and experienced the difference using essential oils has made in her home and the health of her family, I don’t know that I would have believed her. Unfortunately, the oils she uses as well as your favorite brand are cost-prohibitive for me. Agreed, the benefits of quality oils are amazing! So many “oils” on the market are not the same quality (they are often fake or compromised in some way, or have added ingredients to make them cheaper and even added fragrances and to make them smell like perfume ). One thing (among many) that I discovered about Young Living oils besides trusting their quality is they are so concentrated and powerful you don’t need as many drops! They last a long time. The wholesale kit I link to in the post is a great way to start with these quality oils because they are over 50% off retail and you get everything you need to begin a lifestyle change (including the quality diffuser that will help deliver the benefits and concentrate to make two full bottles of the thieves household cleaner so you can get rid of all toxic cleaners). And as a wholesale member you can get the best deals and even free oils all the time!